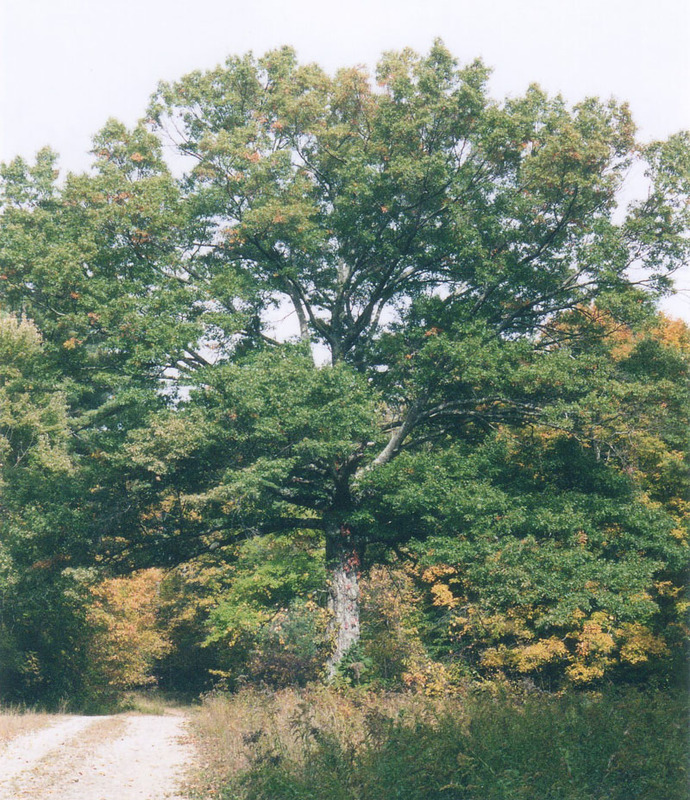 October 2002 photo of the Constitution Oak at Barkhamsted Center. This shot is facing north. The MDC service road at left was the road to Hartland. The water of the Barkhamsted Reservoir is a couple of hundred feet to the right of the Oak tree. The original location of the Center School House is just off this photo, to the right. The Constitution Oak is so named to commemorate the constitutional convention held in Hartford in 1902. The purpose of this gathering was to alter the state's constitution to provide proportional representation to each of the state's residents. Until that time, each town in Connecticut had two representatives in the General Assembly, regardless of population. The advancement of the industrial revolution had, however, rendered very different populations in various towns around the state, the cities had grown far more populous, while the outlying rural towns remained sparsely populated. This meant that (for example), the 428 residents of Union had two representatives in the General Assembly, just like the 108,027 residents of New Haven. Naturally, city residents felt underrepresented. Barkhamsted fell into the "overrepresented" category, with approximately 800 citizens at that time. Through an arrangement made by the Connecticut delegation in Congress, there has been shipped you, by express, a "constitutional oak," to be planted in commemoration of the constitutional convention held this year in Connecticut. Full directions for planting will be found accompanying the tree. Red oak or pin oak seedlings were subsequently shipped to each delegate to the constitutional convention. U.S. Senator Joseph R. Hawley suggested that the convention representatives plant the trees as a reminder of the purpose of the convention and as a symbol of the friendships made during the process. On May 1, 1902, the Connecticut Courant asked the delegates what they intended to do with their tree. 14 of Litchfield County's 26 representatives responded, with six stating they intended to plant the tree on their town green and four of them planning to plant the tree in their own yard. One delegate, the pastor of the Plymouth Congregational Church, planned to plant the tree on the church grounds. [iii] The pin oak sent to the Barkhamsted's delegate was planted in front of the Center School in what was then the center of town. The location chosen was at the intersection of three major roads of the era, one leading north to Hartland, one leading to Barkhamsted Hollow, and one leading west to the Congregational Church. A chain link fence was installed around the seedling to protect it in this busy area, just south of the town green where the militia practiced in the town's earliest days. Many photos from the early part of the 20th century show the Constitution Oak in the background. 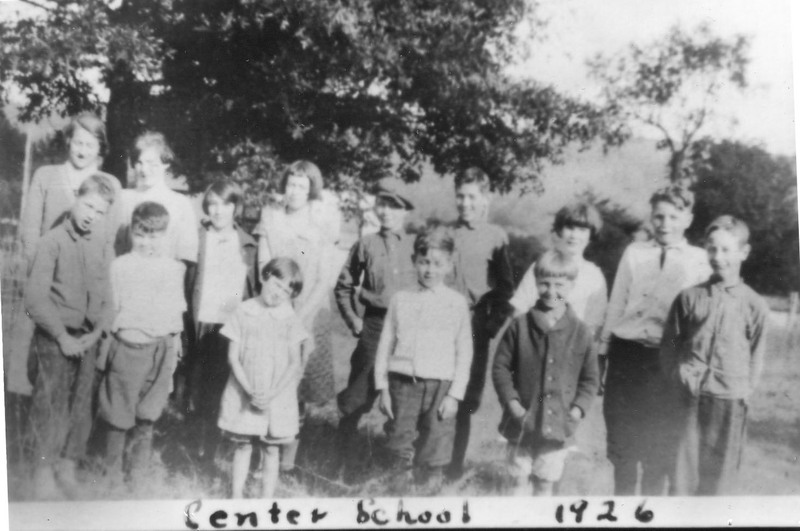 Students of the Center School posing in front of the Constitution Oak (tree to the left). 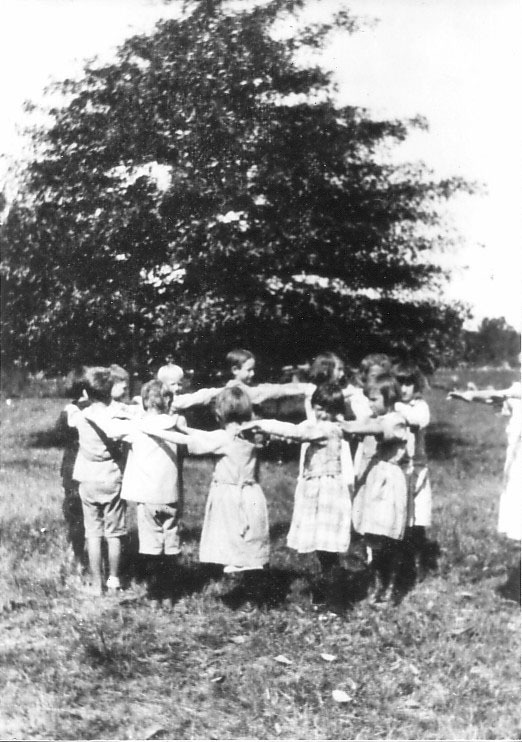 Center School students at play with the Constitution Oak in the background. 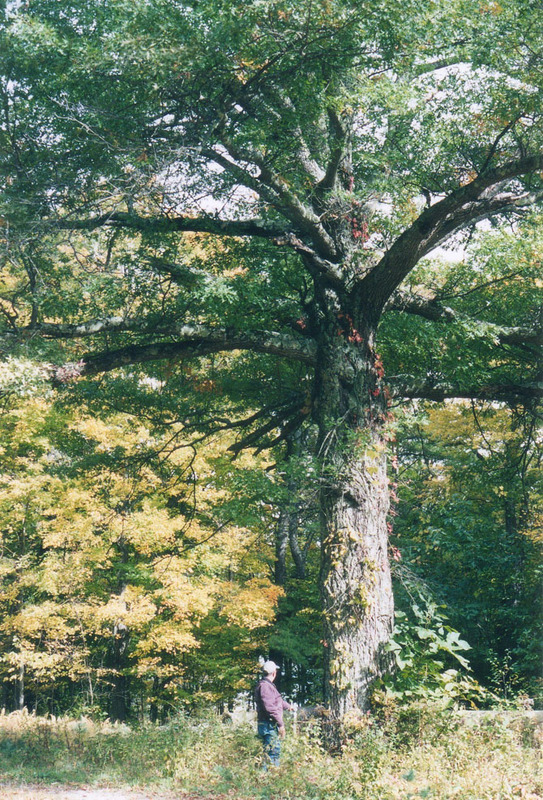 October 2002 - Walt Landgraf inspects the Constitution Oak. This photo shows just how big the oak tree has grown in 100 years since it was planted. Barley visible in the undergrowth is the fence surrounding the tree. Despite its sad association with this tragedy, the Barkhamsted Constitution Oak has endured and prospered for 100 years now. Protected on restricted MDC property it stands healthy, spreading, and beautiful. Phil Royer of the MDC reports that its trunk has reached a diameter of 41 inches (at chest height). Ironically, it not only fulfilled B.T. Galloway's wish to serve as a symbol of the 1902 state constitutional convention, but it stands as the last enduring element of the former village of Barkhamsted, alongside the reservoir that displaced the village. Today, Barkhamsted residents periodically get opportunities to visit the Constitution Oak and see the former town center. Walter Landgraf has led Barkhamsted Elementary fifth graders to the site on their annual outing to the historic Center Schoolhouse, now located up the hill on Route 181. He has also led several popular fall walks to the site, where residents gathered and shared stories of the past. These events have been organized by the Barkhamsted Historical Society, and facilitated by the MDC, who opens the area for these special events and mows and prepares the site for visitors. [i] "Recalling Today, Arbor Day, The Saga of Constitution Oaks," by William Domonell, the Litchfield County Times, Friday, April 29, 1994. [ii] "Constitutional Oaks," Winsted Evening Citizen, Saturday, April 26, 1902. [iii] "Recalling Today, Arbor Day, The Saga of Constitution Oaks," by William Domonell, the Litchfield County Times, Friday, April 29, 1994. [iv] Barkhamsted Vital Records, 1915. [v] "Barkhamsted Boy, Losing Control of Ripper, Killed Today," Winsted Evening Citizen, Wednesday, February 17, 1915. [vi] "Winsted News Notes," Winsted Evening Citizen, Thursday, February 18, 1915.